Brian Walton received his Bachelor of Science degree from California Poltechnic State University, San Luis Obispo, in 1973 and his Master of Science degree in biological sciences from San Jose State University in 1978. He was active in managing birds of prey since 1971 when he studied Prairie Falcons as a field biologist for the California Department of Fish and Game. Brian became the founding coordinator of the Santa Cruz Predatory Bird Research Group in 1977, over time managing captive breeding of Peregrines, Aplomado Falcons, Bald Eagles, Harris's Hawks and Elf Owls. While managing region-wide field operations for threatened and endangered bird populations, he worked closely with biologists of state and federal agencies to craft strategies for the recovery of raptor populations. 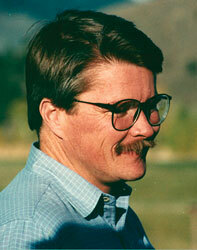 Brian served two eight-year terms on the Board of Directors of The Peregrine Fund between 1982 and 1999, and served as a vice president of the organization between 1985 and 1988. He passed away on June 15, 2007.